I just launched the very first blog. You guys, I’m a blogger 😀 As with everything else in my life, Scarlet has pushed me out of my comfort zone. We are also here getting some new leg braces, or AFO’s (Ankle/Foot/Orthotic) fit as well. She was casted back in early February, so they take about 4-6 weeks to get made and shipped back to Brian. In addition to her back/leg braces, Scarlet is in the process of something called “Serial Casting” on her right leg. She has a condition from her Atrophy called a Contracture. It means that the ligaments and tendons on one side of her ankle is extremely lax causing the opposing ligaments and tendons on the other side to tighten and become spastic. It creates a pigeon-toed and curled-under appearance to the foot that looks completely disfigured. With all vanity aside, it would never function as a weight-bearing foot that way. Standing is essential to her overall well-being. So, we cast her “ballerina foot” (our name for it) and try to slowly and painlessly straighten it out. Thankfully little ankles are pliable and real bendy. After 4 weeks and 4 casts, she is almost completely “in neutral” with her ankle position. So now we move onto the foot and toes. 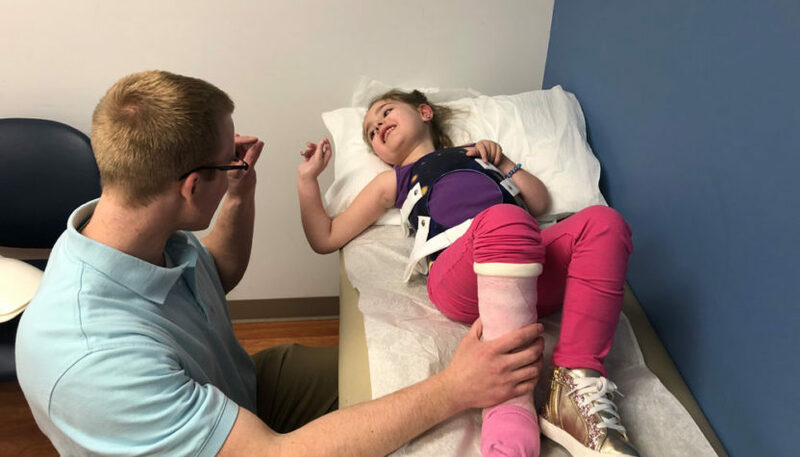 We will be back here in a few weeks once her casting is complete to fit her right-ankle brace. After we’re done, I slug her 55 lb booty over my shoulder and into her wheelchair (that we just had adjusted for growth yesterday!) and we head home in my mom-van. Scarlet doesn’t attend school on Tuesdays so I’m able to book appointments and procedures on this day. Seems like we have something going on every single week. LOL. When school started in August, Scarlet was going to school 3 half-days a week. For our Scarlet’s Smile new-comers, ill give you some back-story. 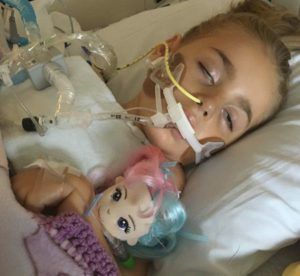 Scarlet was hospitalized in Sept of 2017 with a common cold called “Para-Influenza” basically a common cold who’s symptoms mimics flu symptoms. 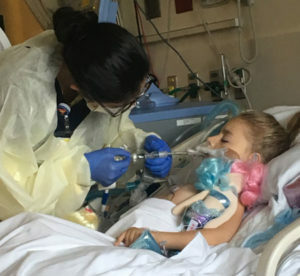 It started as a runny nose, feeling crappy and a junky cough and quickly escalated into an ER visit that landed us admitted at Huron Valley’s pediatric unit. We stayed there 5 days with a bunch of improvement, and Scarlet was discharged. The next morning, she woke up sick as a dog again. Like we had never even been to the hospital for 5 days.. 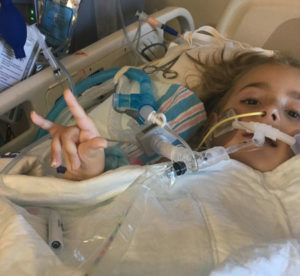 This time, a local hospital wasn’t cutting it so we went to University of Michigan and she was urgently put on life-support, so the fight for her life could begin. The Para-Flu had returned with a vengeance. Obviously school had not been the biggest concern during her stay, so I pulled her from school in mid-September. She had only been in Kindergarten less than a month when she contracted ParaFlu, so I did not see the value in attempting to send her back once she was discharged in November. She spent the next 7 months in a WLCSD home-school program with ANOTHER earth-angel, Kristen, who was assigned as Scarlet’s home-school teacher through Walled Lake Schools. (another HUGE Walled Lake win!) She was still struggling health-wise well into January, and still struggling to keep up academically with her peers. It was decided that when she went back to try Kindergarten again in 2018 that she would start off with a few half days to build endurance. I’m happy to announce she has earned 4 full school days!!! This year was a whole different game. She hasn’t been sick ONCE. we just had to get her over the germ-hump with enough rest to fight the germs her body couldn’t handle. We slowly incorporated full days, and then added another full day. She is KILLING it. And loves it. You are an awesome blogger! I have been and will always be around to support you. My heart is always with yours. Stay strong and give that gorgeous Scarlet big hugs for me! Hillary, this blog is a great idea. I so enjoy you, Scarlet and the whole family! Scarlet inspires everyone. Though I know alot of the backstory, I can’t wait for the future of the “little mermaid” Have been following you all for 2 years or more, your incredible in your own right Hillary! This may turn out to be very cathartic for you putting down the words! Would love to hear some more singing with you and Scarlet or you and your dad. You have a beautiful voice. Good luck with the blog and the playground!!! Great blog! Man I think about all you’ve both been through so happy she’s doing well in school and healthy.